At Middletown Honda, where we are constantly seeing the latest in automotive technology come into our dealership, we always thought that a sporty hybrid coupe would be a great idea. The 2013 Honda CR-Z pulled off the concept in style and we would put it up against any other car on the market. 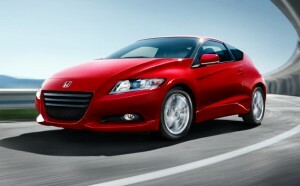 The CR-Z offers great handling, superior fuel economy, and exceptional style at a very affordable price point. To make our case that the CR-Z is the best choice out there, here’s how it compares to another distinctive vehicle, the Mini Cooper. Both the Mini Cooper and the Honda CR-Z put up impressive efficiency numbers and are fun to drive — however, the CR-Z simply has the Cooper beat. With 36 mpg in the city and 39 mpg on the highway by EPA estimates*, the CR-Z will get you farther for your dollar. The Cooper, on the other hand, only gets 29 mpg city and 37 mpg highway. Even with better fuel economy the CR-Z has the Mini Cooper beat in terms of performance. The 1.5L four-cylinder 16-valve SOHC engine and integrated motor assist hybrid system in the CR-Z puts out an impressive 130 hp and 140 lb-ft of torque, while the Cooper’s 1.6L four-cylinder is only good for 121 hp and 118 lb-ft of torque. You’ll feel that real difference especially when accelerating, since the electric motor of the CR-Z can offer instantaneous torque. On top of that the hybrid system of the CR-Z offers three drive modes to tailor your driving experience. Normal is a balance between performance and efficiency, but you can also switch into a more efficient ECON mode, or Sport mode for some fun on curvy hilly roads. While both vehicles come well-equipped, the CR-Z ultimately comes out ahead again. The Mini Cooper can’t match features that come standard on the CR-Z such as automatic climate control, rearview camera, and theft deterrent system. In addition the CR-Z actually packs more cargo space and cabin room than the Mini Cooper. When you’re looking at super efficient subcompacts every cubic foot is important, so the 25.1 cubic feet of cargo volume on the CR-Z is a big deal. Middletown Honda is your local dealership for Mechanicstown, and we’re just east of the Exit 120 on Route 17, if you’re coming from the north or south — or only moments east of Mechanicstown on Route 211. Visit Middletown Honda to test drive the Honda CR-Z today.